Visit the official website of NEET PG and click on the link for results. Enter Candidate ID, Password and given captcha. Click on submit button and download the score card. Authority: NEET PG 2019 Results was released by the National Board of Examinations (NBE) on 31st January 2019. Merit List: NEET PG Results 2019 and candidate's data of State quota seats/ AFMS Institutes/Other Private Universities may be procured from the NBE by the concerned State Authority. It is for generating their merit list or category wise result as per their requirement/reservation policy. Queries: The Medical Counselling Committee (MCC), Directorate General Health Services (DGHS), has no role to play in this matter. In this regard, MCC will not consider or entertain any queries. 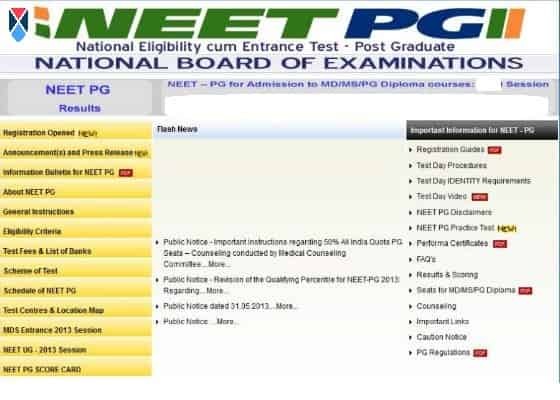 Step 1: Visit the official website and Click on the link for NEET PG Results 2019 then we can see the page as shown in the below. Step 2: Enter the Candidate ID and Password as shown below. Step 3: Click on the login button and download the scorecard. Merit list will be generated for State/ Private Medical Colleges and Universities. Eligibility list is for State Quota Seats as well as for Private Colleges and Universities. Seats: The state quota seats and the seats in private medical colleges/universities shall also be filled by utilizing the result of NEET PG 2019. Entrance Exam: No state government /private medical college/universities including the state governments of Jammu & Kashmir, Telangana & Andhra Pradesh shall be conducting an entrance exam at their own level. 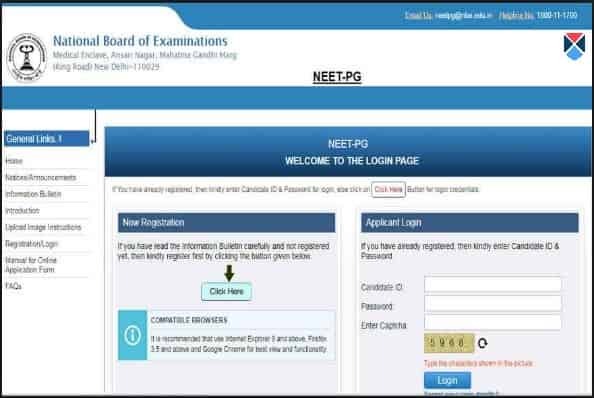 Scorecard: NBE shall be providing only the data of candidates and their scores in NEET PG 2019 to the States/Private Universities/Institutes. Scores sent are those without applying eligibility criteria, reservation criteria etc of the concerned states/ UT, Private Universities or Institutes. State Quota: It may be noted that for State Quota seats/admission to Private Universities/Institutes - final eligibility, state category, State category rank, benefit for In-service candidates, rural posting(if applicable) etc shall be determined/generated by the designated authority of the concerned States. This is applicable as per Regulation and/or their eligibility criteria, guidelines and applicable reservation policies. Eligibility: NBE does not verify the information provided by the candidates during online registration. And hence, candidature will be purely provisional subject to fulfillment of eligibility criteria as mentioned in the Information Bulletin for NEET PG 2019 & criteria of State/Universities/Institutions concerned. Authentication: Candidates must verify from the respective state governments/Private Universities & Institutes. This is necessary only if candidates are applying for admission to State Quota Post Graduate seats/Institute Pool based on applicable Regulation and /or domicile criteria, State/Institute of Graduation, reservation policy etc. Qualifying status: Merely appearing/passing in NEET PG 2019 does not make a candidate qualified and/or eligible for State Quota Seats/admission to Private Universities & Institute. These information will be relevant only after NEET PG 2019 Results are declared by NBE. In case, if two or more candidates obtained equal marks in the competitive entrance examination, their rank will be determined according to the age. Older will generally get preference over younger. 50% All India Quota (AIQ) seats for all State Govt. medical/dental colleges/institutes, except state of Jammu and Kashmir as per merit of PG NEET 2019. For all PG seats of the Deemed Universities as per merit of PG NEET 2019. 50% institutional quota seats for Central Universities of Delhi University, Aligarh Muslim University, and Banaras Hindu University. PG counseling for institutes of Armed Forces Medical Services. The state Govt. of Andhra Pradesh and Telengana are participating in online counseling of All India Quota from the academic year 2019-20 onwards. MCQ: The question paper of NEET-PG 2019 comprises of 300 multiple-choice questions (MCQ) each with four options and only one correct answer. Multiple question papers are used for NEET PG 2019 for different sessions/slots. Scoring Process: A standard psychometrically-sound approach is employed in the design of the NEET exam question paper of NEET PG 2019. This approach has been applied in exam scoring for all large-scale Computer Based Examination which are having multiple question papers. Papers: While all papers (forms) are carefully designed to ensure the creation of a similar difficulty level, the difficulty of each form is determined by the preparation level of each candidate. The different question papers and forms will be evaluated and results will be examined, then the minor differences in the overall difficulty level are accurately measured for normalization. Validity: A post-equating process is necessary to ensure validity and fairness. Equalizing is a psychometric process to balance the differences in the difficulty nature of each paper, so that the difficulty level of all the exam papers (forms) are comparable on a common metric. The candidates will feel the same when they take on the exam across multiple papers and forms. Metrics: During post-equating, exam items are concurrently analyzed and the estimated item parameters (item difficulty and discrimination) are put onto a common metric. Item Response Theory (IRT), the statistical model is supported psychometrically and it is utilized in this process. The performance of the candidate will lead to the good result that is high score even in that level of difficulty of the form administered. Common Scale: In order to ensure appropriate interpretation of performance, the scores must be placed on a common scale or metric. The scaling process will be done by using the linear transformation, which is a merit practice for such tests. Statistical Differences: Post equating, takes into account any statistical differences in examination difficulty and ensures all candidates are evaluated on a common scale. All the examination scores will be valid, proper, fair, and equitable if the above stated steps were followed. The scores which are secured by the candidates will aid in preparing the Merit List for NEET PG 2019. Re-Evaluation: There is no provision for re-checking/ re-totaling/re-evaluation of the question paper, answers, score and no query in this regard will be entertained. Qualifying: Those who attain the minimum qualifying marks would be declared qualified and would be eligible for admissions into the PG medical programs across the country. Result Date: The NEET 2019 Results were announced online on 31st January 2019 and candidates will need to download the NEET PG 2019 Rank Card also. The rank card was released on 6th February 2019. As per, the Postgraduate Medical Education (Amendment) Regulations, 2012 the following are the qualifying criteria for candidates to be eligible for admissions to any post-graduate courses. For General Merit (GM) candidates, it is necessary to obtain a minimum marks at 50th percentile for NEET PG 2019. For SC/ ST/ OBC candidates, it is necessary to obtain a minimum marks at 40th percentile for NEET PG 2019. For PWD candidates, it is necessary to obtain a minimum of marks at the 45th percentile for NEET PG 2019.